A unique and adaptable SOLUTION FOR organized Bike PARKING AND STORAGE! 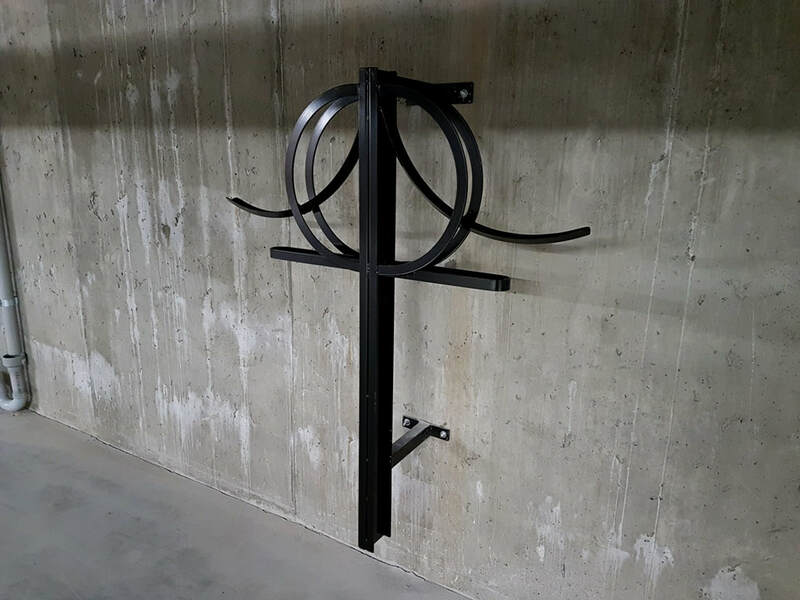 Rinas Fabrication's vertical bike racks are completely constructed from steel for durability, and are uniquely designed to hold a bicycle in an upright vertical position with ease of use. 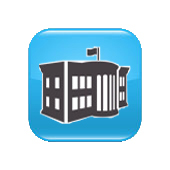 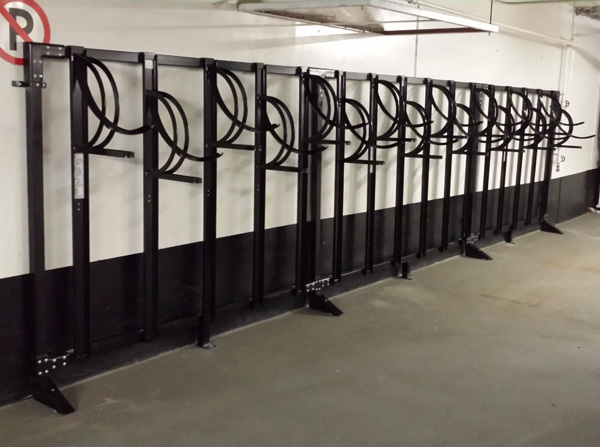 With no moving parts, the racks are essentially maintenance free and require no upkeep. 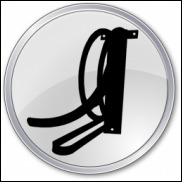 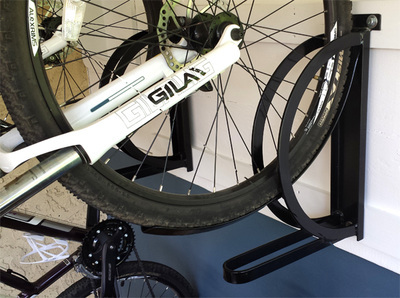 The locking bar provides a safe place to lock the front tire and frame of the bike right to the rack itself, and only the rubber tire of a bicycle will make contact with the rack, so it can never damage the rim of the bike (unlike other 'hook design' bike racks on the market). Five completely adaptable styles of vertical bike racks are available for both indoor and outdoor bicycle parking. 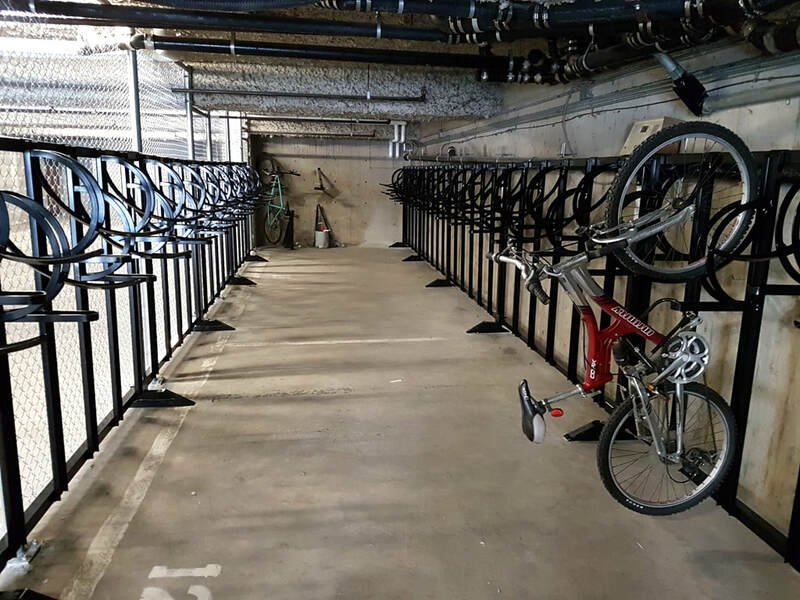 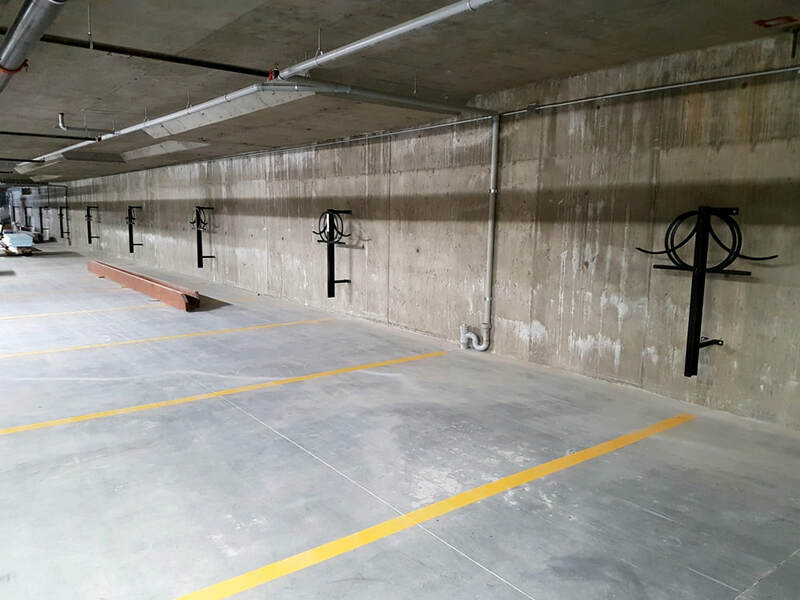 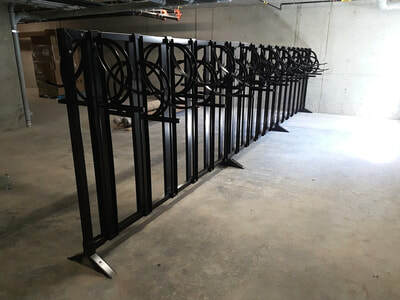 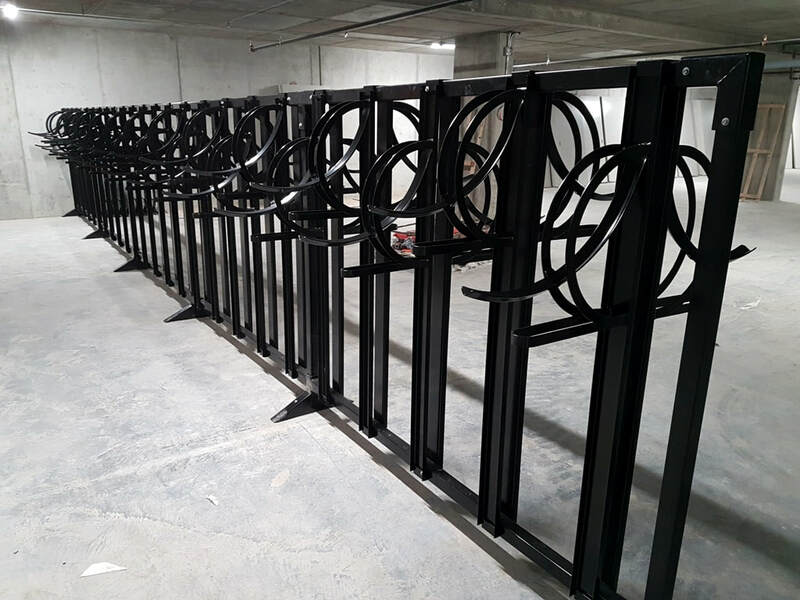 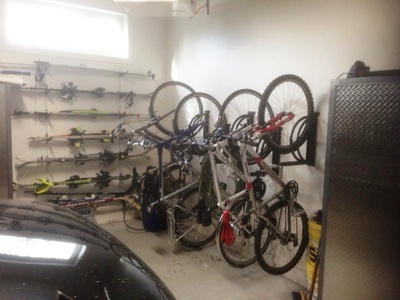 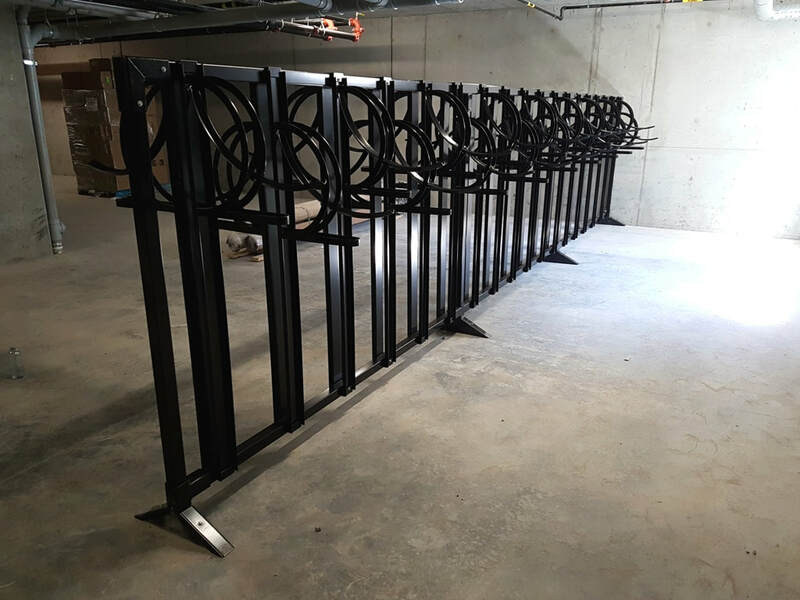 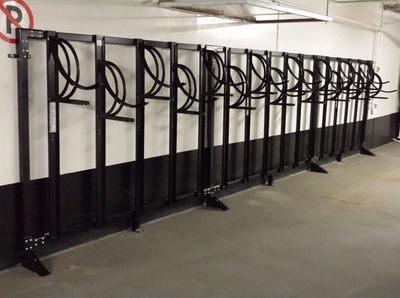 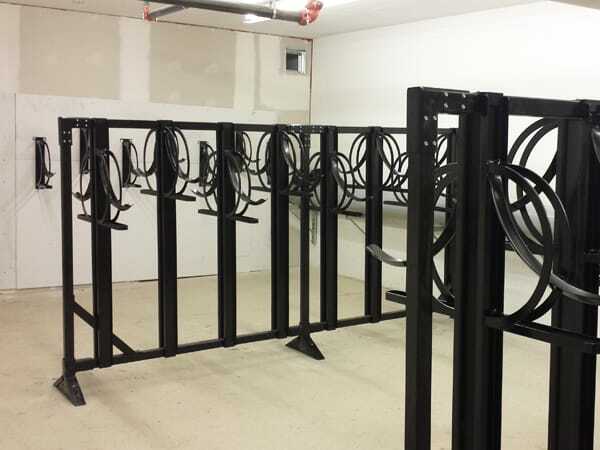 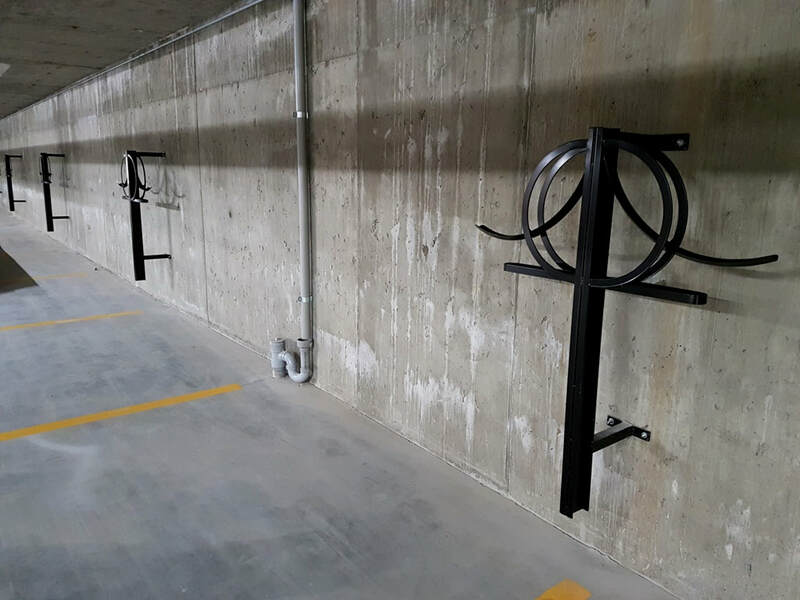 Whether you're looking to upgrade your bicycle storage room in the condo or apartment you manage, or you're just trying to free up some space in your garage at home, our vertical bike racks will help you save space and organize any bicycle parking area! Wall mounted vertical bike rack. 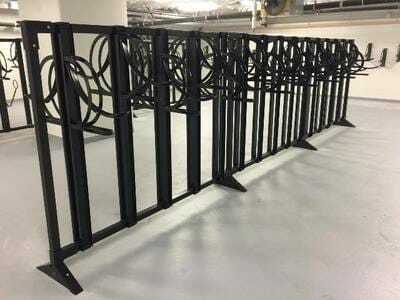 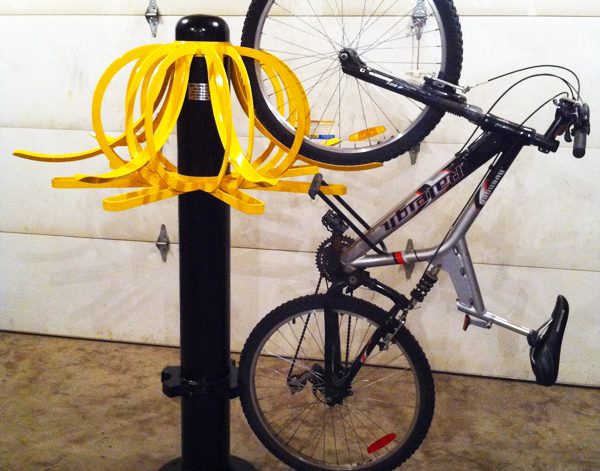 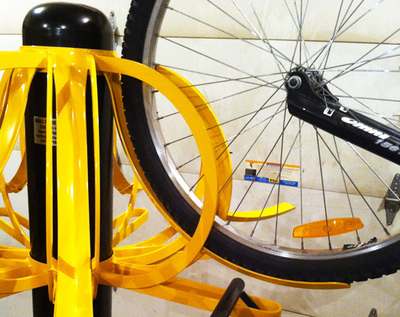 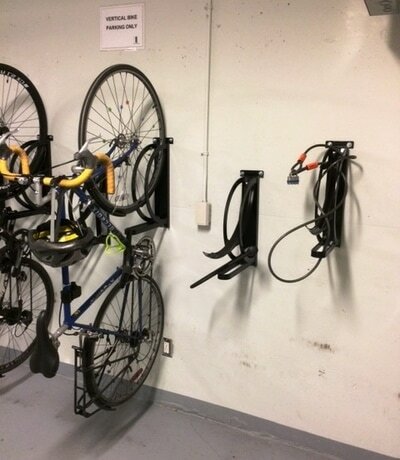 Ideal for bicycle parking in condos/apartments, office buildings, and home use in garages etc. Saves space and organizes any bicycle parking area. 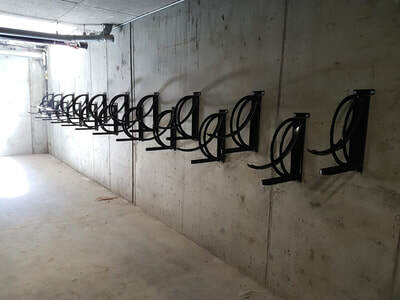 Wall mounted vertical bike rack. Two bike capacity. 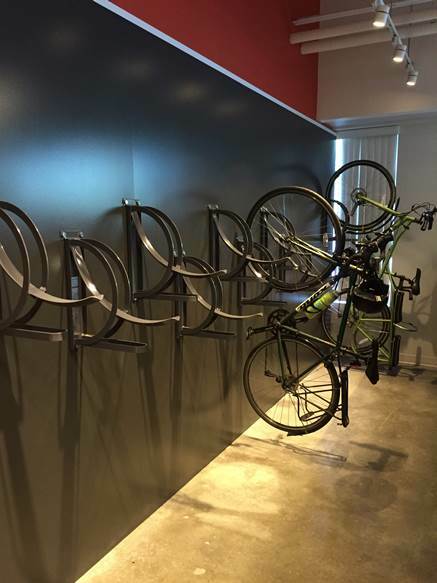 Bikes will only protrude from the wall 20-24 inches (or the length of the handle bars). Used for bicycle parking in front of vehicles in parkade areas. Custom length vertical bike rack, built to desired length and capacity to fit any bicycle parking area. 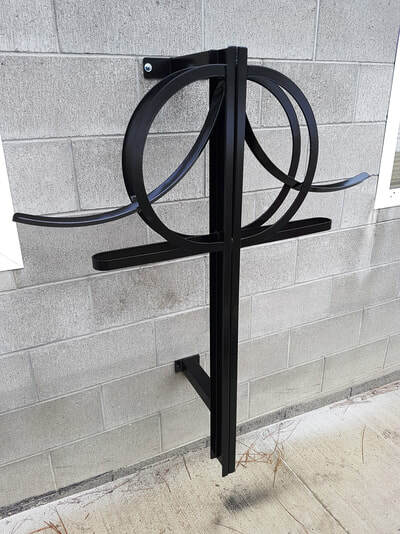 Free standing (no wall support needed). 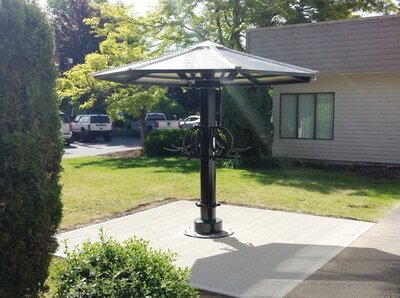 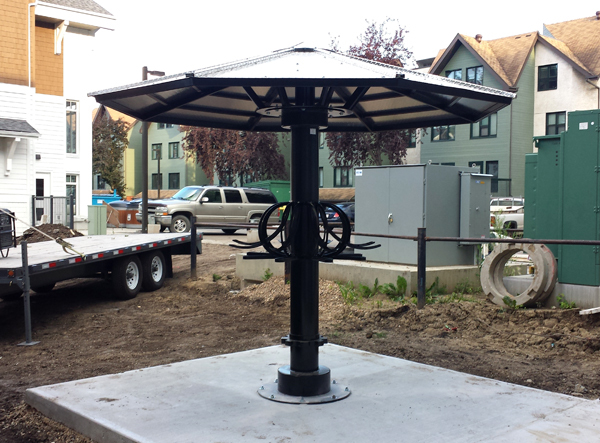 Can be installed in the middle of a room and only requires bolting down to a concrete surface. 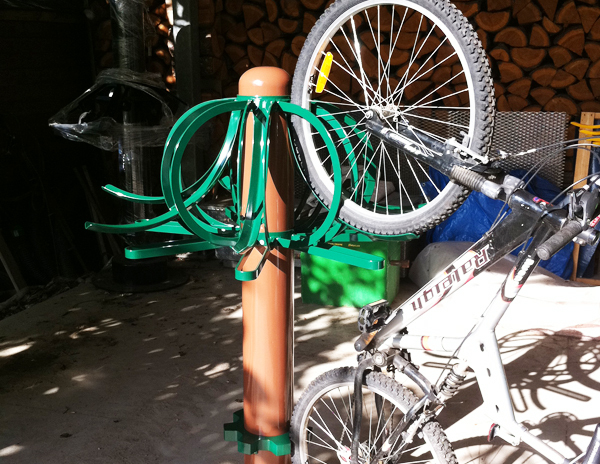 Cylindrical bike rack. 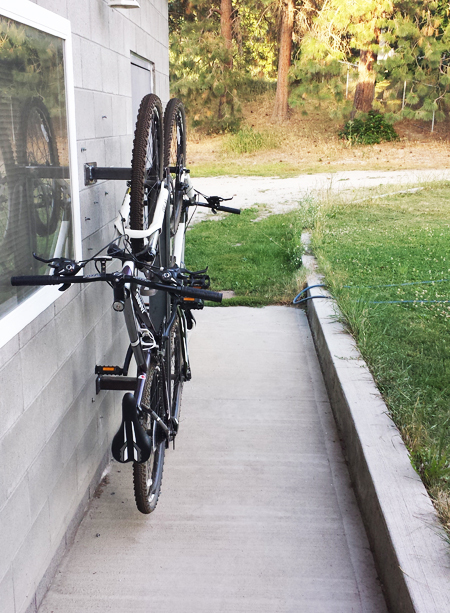 Seven bike capacity. Each bike hangs individually, so there's no interference when loading/unloading bikes. 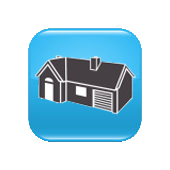 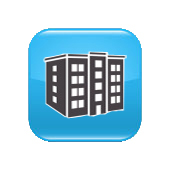 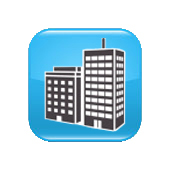 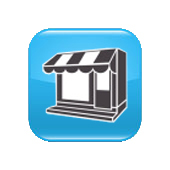 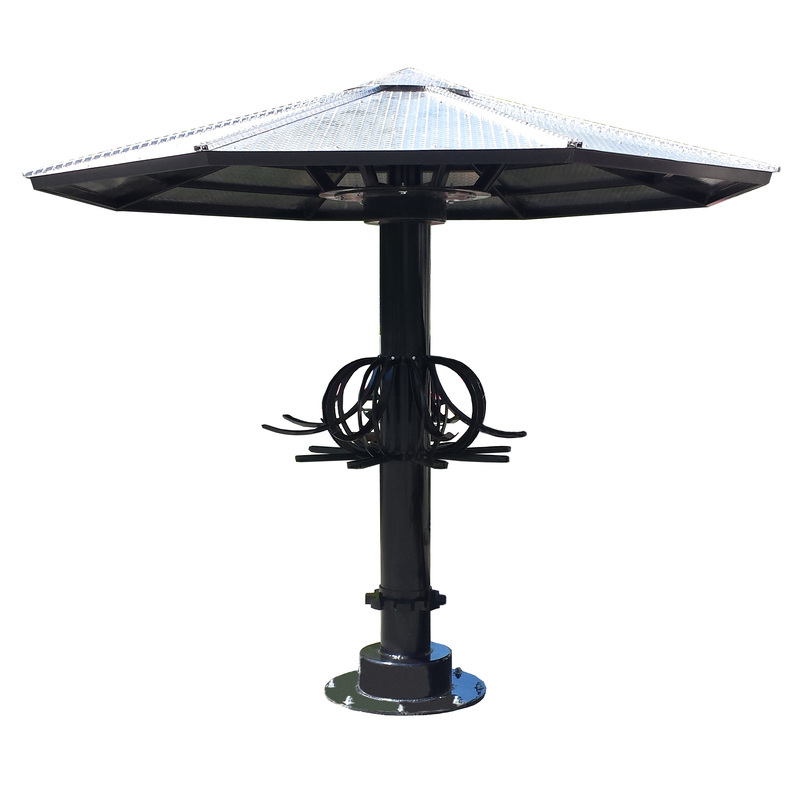 Available in a rotating model which is ideal for corner spaces. Can also be ordered in a two tone color scheme. 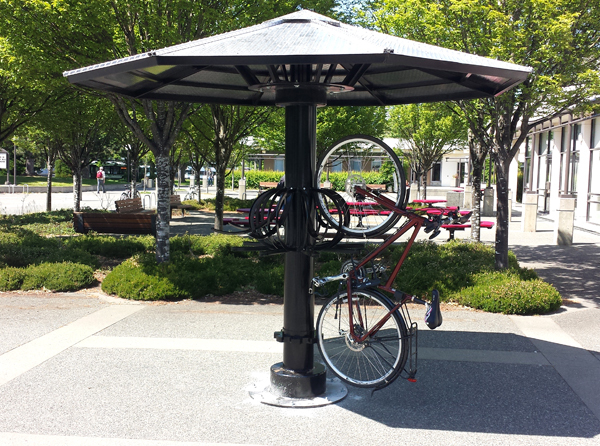 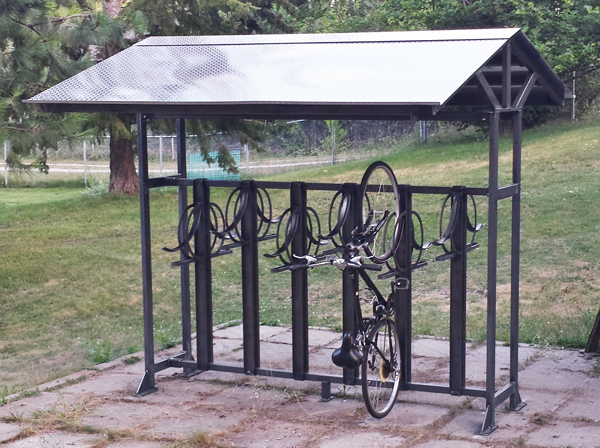 Roofed cylindrical bike rack. 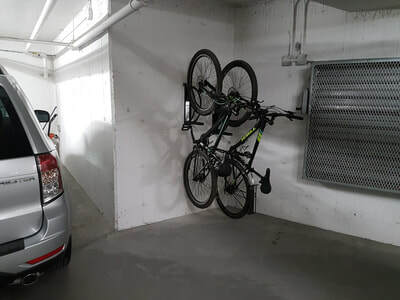 Eight bike capacity. 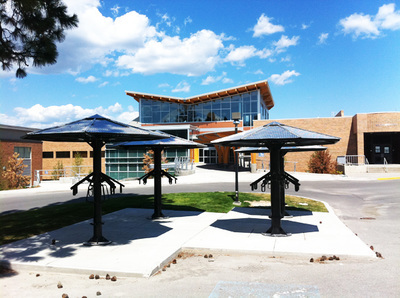 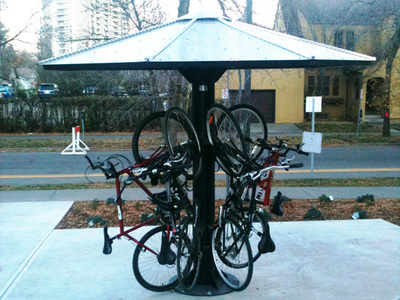 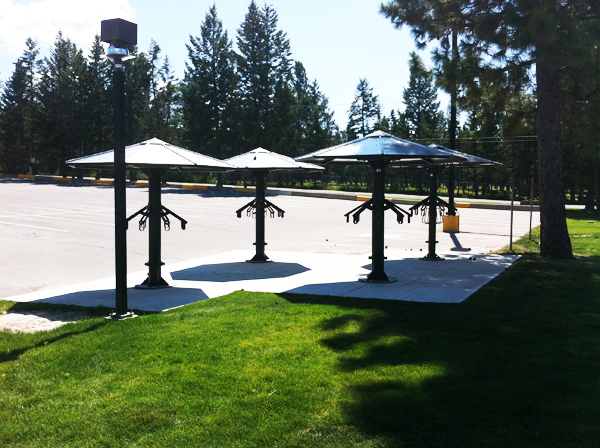 Durable diamond checkered aluminum roof to shelter bikes from rain/snow. 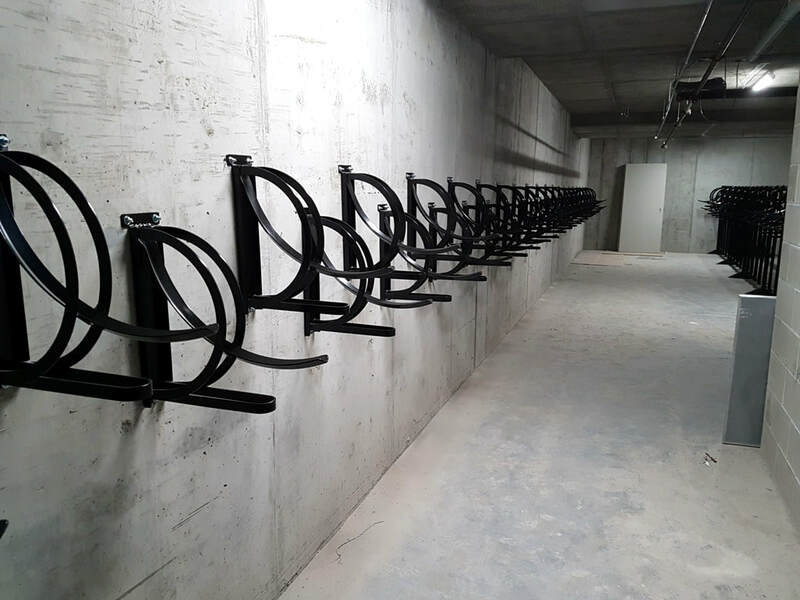 Each bike hangs individually, so there's no interference when loading/ unloading bikes. 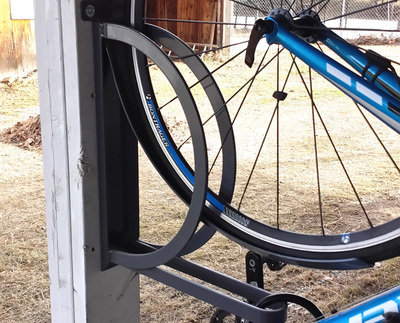 EASY TO USE, NO LIFTING REQUIRED! 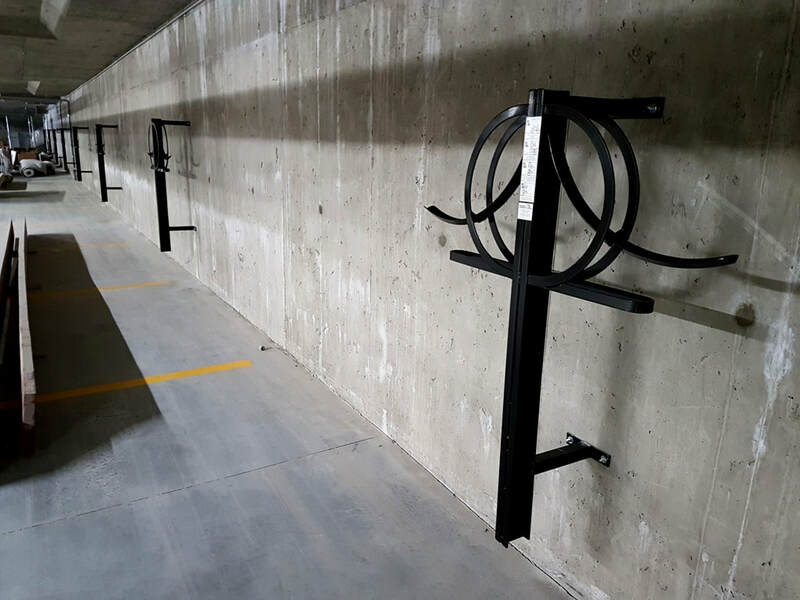 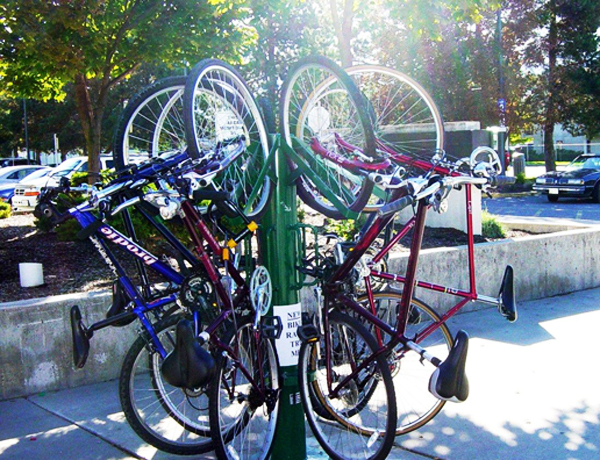 All of our vertical bike rack styles were designed for ease of use. 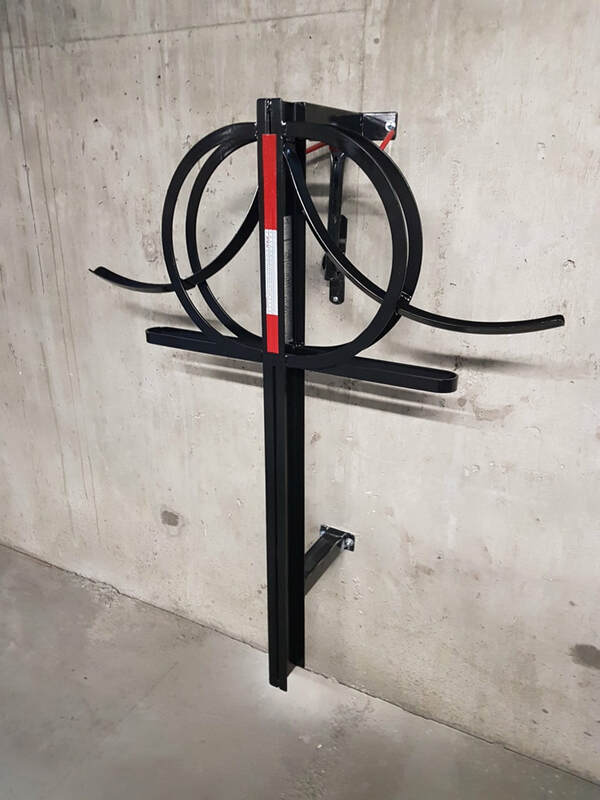 As shown in the above video: to load your bike, simply tilt it onto it's back tire and lightly push it into the curved tire rest, where it will stay in the vertical position by itself. 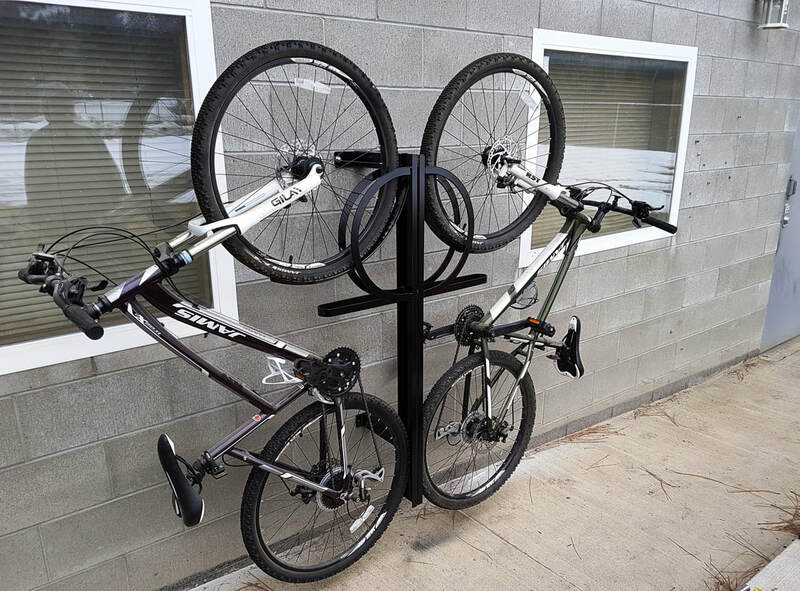 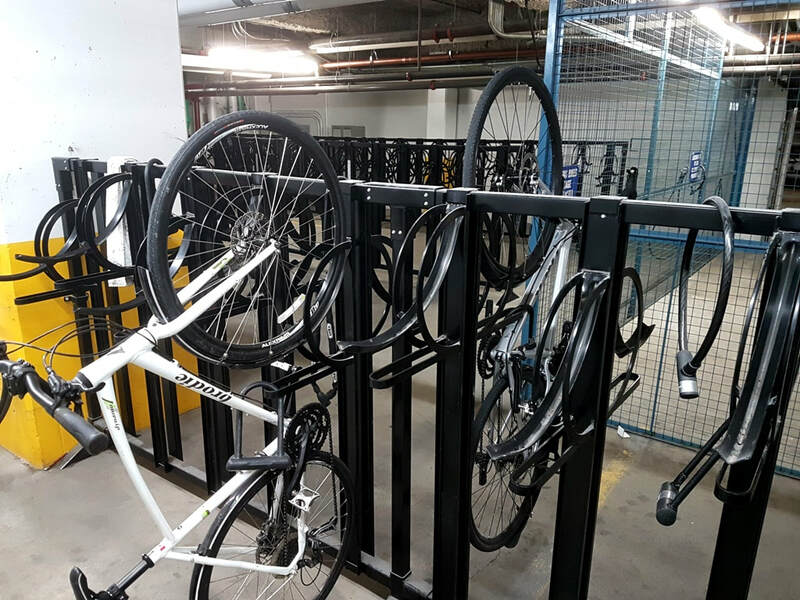 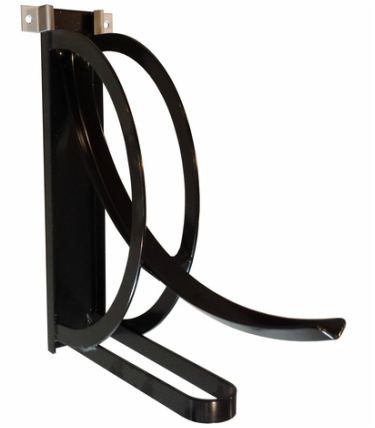 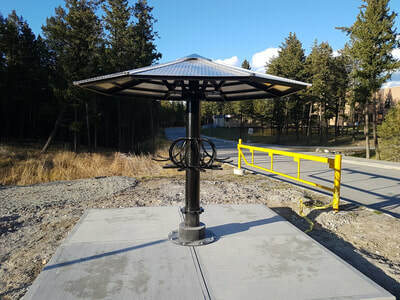 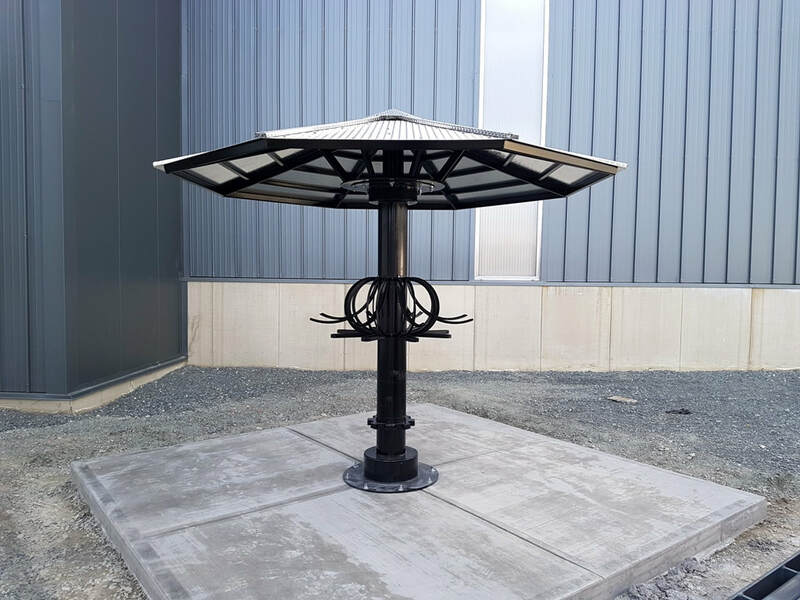 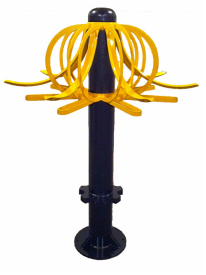 Unlike other vertical bike racks that require you to hang the bike by it's rim, our vertical bike racks only make contact with the rubber tire, so it can never damage your bike. 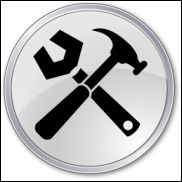 The bike frame and front tire can then be secured to the racks locking bar with a u-bolt or other locking device.